India and Pakistan consume more than one-fifth of global palm oil. India consumes 16 percent of the world’s total, while Pakistan uses five percent. Virtually all palm oil is imported from Indonesia (75 percent) and Malaysia (almost 25 percent). Non-NDPE refiners account for 58 percent of Crude Palm Oil (CPO) imports, making India a large ‘leakage’ market for unsustainably produced palm oil. Seven large Indian refiners account for 34 percent of the ‘leakage’ market, including Emami Agrotech, Allana/IFFCO and Gokul Agro Resources. India’s imports consist mostly of CPO, with refining taking place in India. The largest refiners with NDPE policies are Adani Wilmar, Golden Agri-Resources, Musim Mas, Bunge and Cargill. Indonesian plantation companies excluded by NDPE buyers have found replacements in India. The main examples include Darmex Agro/Duta Palma, Austindo Nusantara Jaya and Sumbermas Sawit Sarana. Through non-NDPE refiners, unsustainable palm oil may enter the Indian and Pakistani supply chains of NDPE committed consumer goods companies. Examples include sales by Emami Agrotech to Unilever and PepsiCo. Pakistan mostly imports refined palm oil, 81 percent of which comes from traders or refiners with NDPE policies. Despite the absence of NDPE policies among Pakistani processors, the country is not considered a ‘leakage’ market. The main exporters to Pakistan without effective NDPE policies are Felda (FGV Holdings) and Permata Hijau. The Hayel Saeed Anam Group, a ‘leakage’ refiner which is linked to primary forest clearing in Papua, sold 3,000 tonnes of palm oil to the United Nations in Pakistan during the first nine months of 2018. It remains unclear what sustainability criteria the United Nations uses to select its suppliers. India and Pakistan use 14.1 million tonnes of palm oil annually, making up 20.4 percent of global consumption. The countries grow a small amount of oil palms domestically, making them dependent on imports. For example, India’s production of palm oil was 0.4 million tonnes in 2017. Palm oil production in Pakistan is negligible. Both India and Pakistan import around 75 percent of their palm oil consumption from Indonesia, with the remainder mostly coming from Malaysia. A recent report by Rabobank Research estimates that in 2030 India will be importing over 15 million tonnes of palm oil. To reach that level, imports would increase 3 percent each year. These projections exclude the possible rise of palm oil use in transport fuels. Sources: United States Department of Agriculture, Oilseeds: World Markets and Trade, October 2018. Next to palm oil, India’s vegetable oil imports comprise of soybean and sunflower oil. Its domestic production of vegetable oils stands at around 8 million tonnes over the last five years, the lion’s share being rapeseed/mustard, soybean or groundnut oil. The domestic production of vegetable oils in Pakistan is approximately 0.4 million tonnes. Oil preferences in India are region specific. In general, Indian households prefer soybean, sunflower and mustard oil in their food. These oils, however, are often blended with palm oil. The food industry predominantly uses palm oil. In Pakistan, the dominant oils are palm and soybean oil. In November 2017, Chain Reaction Research reported that 74 percent of the palm oil refining capacity in Indonesia and Malaysia is covered by No Deforestation No Peat No Exploitation (NDPE) policies. CRR’s current calculations show that only 42 percent of the Indian CPO import is accounted for by refiners with an NDPE policy (see Figure 2). This means that the majority of the CPO that is entering India is not covered by NDPE policies of Indian refiners. NDPE signatories mainly comprise of well-known international processors/traders of palm oil, while non-NDPE refiners operate only in the domestic Indian market (except for Allana/IFFCO and COFCO Agri). Adani Wilmar (when including Ruchi Soya Industries and its joint venture with KTV) account for 25 percent of the imports in the first eight months of 2018 (see Figure 2). The largest seven non-NDPE refiners account for 34 percent of India’s CPO imports: Emami Agrotech, Gokul Agro Resources, Santhoshimathaa/Priya Gold Oils, 3F Industries, Allana/IFFCO, COFCO Agri and JVL Agro Industries. Figure 3 shows India’s 15 largest importers of Crude Palm Oil (CPO) and Refined, Bleached and Deodorised (RBD) palm olein for the first eight months of 2018, according to trade data for the eight Indian ports that together cover more than 95 percent of India’s palm oil imports. Imports totalled 6.8 million tonnes of CPO and 2.4 million tonnes of RBD palm olein. Source: Infodrive, Refiners’ websites. HS codes 15119020 RBD Palm Olein (Edible Grade) In Bulk and 15111000 Crude Palm Oil (Edible Grade) In Bulk. Harbours: Kandla, Kolkata Sea, Krishnapatnam, Chennai Sea, Kakinada, Nhava Sheva Sea, Mangalore Sea, Tuticorin Sea and Mundra. India’s leading processor of palm oil is a 50-50 joint venture between Adani Enterprises and Wilmar International. Adani Wilmar started in 1999 with a single refinery, but since then, it has expanded significantly. According to trade data, Adani Wilmar imported 980,000 tons of CPO in the first 8 months of 2018, up from 850,000 tonnes over all of 2017. This increase is likely a result of the acquisition of two refineries. Moreover, in 2018 Adani Wilmar was the highest bidder to acquire the debt-ridden Ruchi Soya Industries, one of India’s largest processor/traders of palm oil. The acquisition, however, is not yet final, as it is the subject of a court case initiated by Patanjali, a company also in the race to buy Ruchi Soya. Adani Wilmar (when including Ruchi Soya Industries and its joint venture with KTV) presently accounts for 25 percent of India’s palm oil imports. The wording of Wilmar’s NDPE policy suggests that its scope also covers Adani Wilmar, Adani Wilmar/KTV and Ruchi Soya Industries. On Wilmar’s Supply Chain Map, the imports of Adani Wilmar and Adani Wilmar/KTV are also listed, and both companies appear to buy from NDPE companies only. Ruchi Soya did not have an NDPE policy prior to the acquisition by Wilmar. It is expected to be included in Wilmar’s Supply Chain Map once the acquisition is final. Emami Agrotech is the edible oil and biodiesel arm of the Emami Group, an Indian business conglomerate. Emami Group’s flagship company is the listed Emami Ltd, which is primarily engaged in the manufacturing and marketing of personal care and healthcare products. Emami Agrotech is not listed on a stock exchange, and it also does not publish annual reports. It has refineries in Haldia (West Bengal) and Krishnapatnam (Andhra Pradesh), with a total refining capacity of 5,000 tonnes per day. Emami Agrotech is the second largest importer of edible oil in India and is among the world’s largest processors/traders of palm oil without an NDPE policy. The websites of Emami Agrotech and the Emami Group do not provide information about its sustainability criteria for sourcing palm oil. Emami Agrotech, an RSPO member, said in its RSPO Annual Communications of Progress 2017 that it handled 1.1 million tonnes of palm oil and palm oil products in the past year. However, it had not sold any RSPO-certified products. In the first eight months of 2018, Emami imported 725,000 tonnes of CPO and 173,000 tonnes of RBD palm olein. Emami does not publish a list of supplying mills. Allana/IFFCO is also among the world’s largest processors/traders of palm oil without an NDPE policy. Globally, it handles more palm oil than Emami Agrotech. The Allana group is a family-owned company, headquartered in India. IFFCO, based in the United Arab Emirates, is part of the Allana Group. Allana/IFFCO has palm oil refineries in Indonesia (PT Synergy Oil Nusantara), Malaysia (in a joint venture with Felda) and India. IFFCO is also a multi-food company with a large customer base in the Middle East, with presence also in Pakistan. In its ACOP 2017, the Indonesian refinery company PT Synergy Oil Nusantara (PT SON) reported to have handled 788,000 tonnes of palm oil and palm oil products in the past year. PT SON, a well-known ‘leakage’ refinery, generated 55 percent of the revenue of PT Austindo Nusantara Jaya (ANJ) and 20 percent of the revenue of PT Sawit Sumbermas Sarana in the first half of 2018. However, ANJ recently stated that the sales commitment with PT SON has been terminated. In the first 8 months of 2018, Allana/IFFCO’s Indian refinery company Frigorifico Allana bought 146,000 tonnes of CPO and 34,000 tonnes of RBD Palm Olein from sister companies in Indonesia that source from third parties, as IFFCO does not have plantations itself. In its ACOP 2017, the company reported that it handled 264,000 tonnes of palm oil and palm oil products in the past year. Trade data for imports to Pakistan show that IFFCO Pakistan bought 96,000 tonnes of RBD palm olein during the first nine months of 2018. IFFCO Pakistan sourced from refineries that belong to groups of companies that have NDPE policies (except for 7,250 tonnes from Permata Hijau). In its ACOP 2017, the Malaysian 50/50 joint venture Felda IFFCO reported handling 1,370,000 tonnes of palm oil and palm oil products in the past year. Felda IFFCO, for the most part, sources from Felda plantations. Felda does have an NDPE policy, but its implementation falls short, as illustrated by recent deforestation practices . Gokul Agro Resources Limited (referred to Gokul) is listed on the Indian stock exchange. It is not a member of the RSPO. Its Singaporean subsidiary Riya International Pte Ltd is its trading arm. In the first eight months of 2018, Gokul imported 340,000 tonnes of CPO and 40,000 tonnes of RBD palm olein, via the port of Kandla. Gokul’s oil refining capacity amounts to 1,900 tonnes per day. On Gokul’s website, it does not provide sustainability criteria for sourcing palm oil, although it lists which palm oil companies sell to Gokul. Gokul has been a new, large customer for the Indonesian company PT Austindo Nusantara Jaya (ANJ), after main processors with NDPE policies stopped buying from ANJ because of its forest clearing in West Papua province. Quarterly reports published by ANJ show that, in 2017, Gokul bought USD 46 million worth of palm oil from ANJ, which made up 29 percent of ANJ’s revenue for the year. In the first quarter of 2018, Gokul generated 15 percent of ANJ’s revenue. Unilever, PepsiCo and Procter & Gamble and Nestlé are among the world’s largest food and/or personal care companies, and together they use around 4 percent of the world’s palm oil. These four companies have prominent businesses on the Indian subcontinent, and at least three of them also import palm oil products into India and Pakistan from companies without NDPE policies. Unilever and PepsiCo have both reported to be a palm oil customer of Emami Agrotech. PepsiCo is a customer of IFFCO Pakistan, while Unilever suspended buying from IFFCO. The Pakistani trade data show that Procter & Gamble Pakistan imported some 5,000 tonnes of palm oil in the first nine months of 2018 from the Malaysian trader Kalmart Systems that has no NDPE policy. Kalmart Systems also supplies Unilever. It remains unclear to what extent the Indian and Pakistani subsidiaries of these companies actively engage with third party suppliers on sustainability criteria for sourcing palm oil. Indonesian trade data for the first half of 2017 on CPO exports from Indonesia provides insight on the Indonesian exporters to India (see Figure 4). The Indonesian data confirms that India constitutes a large ‘leakage’ market for unsustainably produced palm oil. The palm oil companies Torganda, Incasi Raya, Permata Hijau, Darmex Agro, Austindo Nusantara Jaya and Sawit Sumbermas Sarana accounted for 29 percent of the CPO exports to India while having no effective NDPE policies. Other exporting processor/traders added some 4 percent to the non-NDPE total. Torganda has operations in Sumatra only, and was involved in illegal deforestation in North Sumatra in the past. The Indonesian Supreme Court ruled in 2007 that the company should return 47,000 hectares of occupied forestland to the state. As of 2018, Torganda has, however, still not returned the land. Since at least 2015, no cleared forest or peatland clearing has been observed. The company is not a member of the RSPO, and main processors/traders with NDPE policies still buy from Torganda. That is shown in their lists of supplying mills. According to Indonesian trade data, exports to India consisted of CPO from the company’s own palm oil mills in Sumatra. Incasi Raya (sometimes referred to as Gunas group) is one of the ten largest palm oil companies in Indonesia, measured by planted area. In August 2015, Wilmar engaged with the company, as Incasi Raya’s subsidiary PT Sumatera Jaya Agro Lestari (PT SJAL) cleared peatland forests in West Kalimantan. Between 2015 and 2018, no new forest or peatland clearing has been observed. However, recent satellite data shows that PT SJAL has resumed its clearing of peatland forests, with 100 hectares cleared between August 2018 and October 2018. Main processors/traders with NDPE policies still buy from Incasi Raya. According to Indonesian trade data, its exports to India consists of CPO from the company’s own palm oil mills in Sumatra. The exports were shipped to Padang (West Sumatra), where Incasi Raya has large storage facilities. Permata Hijau, meantime has an NDPE policy, but it has not published any specific details about the implementation of its policy. For example, the company does not reveal its suppliers, and no grievance procedure is visible on its website. It is not clear which Indian refiners use Permata Hijau’s CPO. Trade data shows Permata Hijau’s Singaporean subsidiary Virgoz Oils & Fats Pte Ltd as the importer of all the CPO. In its RSPO Annual Communications of Progress (ACOP) 2017, Permata Hijau reported that Pakistan and Bangladesh are also large markets for the company, giving it a large presence on the Indian subcontinent. In its ACOP 2015, Permata Hijau reported to handling 1.6 million tonnes of palm oil and palm oil products in 2015. Darmex Agro, Austindo Nusantara Jaya and Sumbermas Sawit Sarana are examples of companies that found new markets in India after some of the world’s main processors and traders stopped sourcing from them. During the first half of 2017, Darmex Agro (also known as Duta Palma) exported 110,000 tonnes of CPO to India. It is unclear which Indian refiners used the imports, given that the trade data shows Darmex Agro/Duta Palma’s Singaporean subsidiary Palmbridge Pte Ltd as the importer. Darmex Agro, which is among the 20 largest palm oil companies in Indonesia, had an oil palm planted area of at least 160,000 hectares in 2013. That translates into producing at least 600,000 metric tonnes of CPO annually. The company also has refinery and biodiesel facilities. Darmex Agro is an opaque company with a reported poor record on environmental matters. 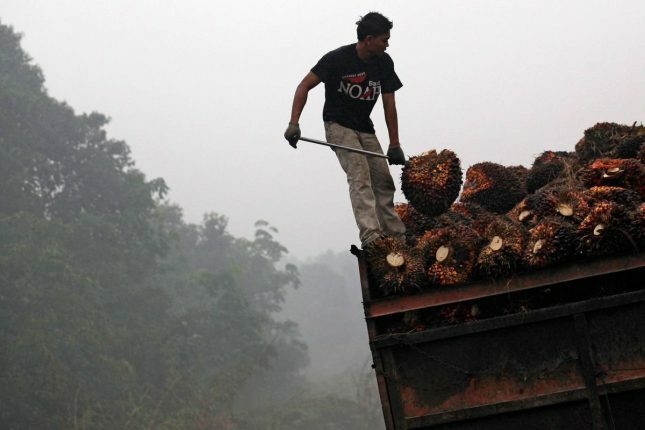 The RSPO evicted Darmex Agro in 2013 after it ignored efforts to resolve an RSPO complaint submitted in 2009. In February 2010, Unilever told its suppliers not to source palm oil from Darmex Agro. Presently, most NDPE processors and traders refrain from buying from Darmex Agro. During the first half of 2017, Austindo Nusantara Jaya (ANJ) exported 53,000 tonnes of palm oil to India, of which 44,000 tonnes to Gokul Agro Resources Limited and 9,000 tonnes to Just Oil & Grains Pte Ltd.
ANJ, listed on the Indonesian Stock Exchange and a member of the RSPO, had an oil palm planted area of 51,000 hectares at the end of 2017. 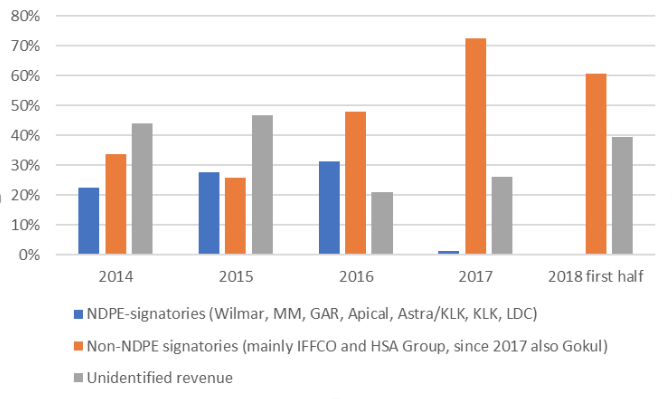 Figure 5 below shows that NDPE signatories have moved away from the company over the years, based on quarterly reports by ANJ. ANJ’s controversy with NDPE policies revolves around its two plantation companies in West Papua that have a total concession area of 55,000 hectares. ANJ is clearing forests there to make way for oil palm plantations. For example, in block 1 of ANJ’s plantation company PT Permata Putera Mandiri, the company cleared some 1,400 hectares of forests in 2018 (see Figure 6). Clearing has been detected as recently as 20 November 2018. According to the land cover map 2017 from the Indonesian ministry for Environment and Forestry, about half of the cleared 1,400 hectares were primary forests. Quarterly reports published by Sumbermas Sawit Sarana (SSMS) show that, during the first half of 2017, SSMS generated 10 percent of its revenue from the Singaporean trading company Just Oil & Grain Pte Ltd. During the second half of 2017, the amount increased to 28 percent and averaged 18 for the entire year. Just Oil & Grain Pte Ltd became a customer after main processors/traders of palm oil with NDPE policies stopped sourcing from SSMS. Indonesian trade data over the first half of 2017 shows that Just Oil & Grain Pte Ltd is a large supplier of CPO to the Indian palm oil market (see Figure 7). Pakistan’s palm oil market is three times smaller than the Indian market, and has fewer palm oil refineries. It mostly imports RBD palm olein. The table below shows Pakistan’s 5 largest importers of RBD palm olein and CPO. By far, most of the palm oil imported to Pakistan arrives at Port Qasim Import Bulk (PQIB), which has large bulking facilities. The three Karachi ports, based on trade data for the first nine months of the year, received 2.2 million tonnes of CPO and RBD palm olein during that timeframe. The Mapak Edible Oils refinery, a joint venture of Westbury (40 percent), Felda (30 percent) and KLK (30 percent), is the only facility that uses CPO as a feedstock. The imported amount totaled 90,000 tonnes for the first nine months of 2018. The other companies among the 5 largest importers mainly process RBD palm olein into cooking oil. The market for processing palm oil into cooking oil in Pakistan is fragmented. In India, 74 percent of the RBD palm olein and CPO is imported by the 15 largest importers, for Pakistan the figure is 45 percent. Among the five largest importers, only Felda, KLK and IFFCO also operate internationally. According to the president of the Islamabad Chamber of Commerce and Industry, the country is looking to reduce its import bill. The country has invited Indonesian investors to establish joint ventures in Pakistan for the production and processing of palm oil. The table below shows the 10 largest exporters of CPO and palm oil refinery products (excluded palm kernel expeller) to Pakistan over the first nine months of 2018. The percentage of exporting processor/traders that have NDPE policies amounts to 81 percent of imports. Despite the absence of NDPE policies by Pakistani processors, the palm oil market in Pakistan is still largely covered by NDPE policies. Felda (FGV Holdings, 9 percent of the exports) and Permata Hijau (6 percent) are the largest processors/traders exporting to Pakistan without effective NDPE policies. The Hayel Saeed Anam Group (HSA), a conglomerate active in the Middle East and many other countries, is among the ten largest processors/traders of palm oil globally. It has two refineries in Indonesia and one in Malaysia, giving the company total refining capacity of 2.4 million tonnes per year. HSA handles more than 2 million tonnes of palm oil annually. According to trade data, HSA sold at least 3,000 tonnes of palm olein vegetable oil to the United Nations World Food Programme in Pakistan during the first nine months of 2018. HSA’s Indonesian subsidiary PT Pacific Medan Industry exported the products, but it is not clear what sustainability criteria the United Nations uses to select its suppliers. HAS, which has no NDPE policy, does not, for the most part, reveal its suppliers and or a grievance procedure on its website. In September 2018, HSA revealed a partial list of its suppliers. Many non-NDPE palm oil companies featured on this preliminary list, such as the Indonesian BEST Industry Group, PT Sintong Abadi (owned by Dupont & Leosk and related parties), Allana/IFFCO, and Sarawak Oil Palms. On 15 October 2018, the NGO Environmental Investigation Agency (EIA) submitted two formal complaints to the RSPO in relation to five RSPO members that are part of HSA. The complaints focus on alleged ownership by HSA or HSA directors of plantation companies in Papua that are presently clearing forests for oil palm. Between January and October 2018, the plantation companies PT Megakarya Jaya Raya and PT Kartika Cipta Pratama cleared at least 1,900 ha of forests (marked in red in the map above). The land was primary forests, according to the land cover map 2017 of the Indonesian ministry for Environment and Forestry. There have also been questions surrounding Malaysian company Pacific Inter Link Sdn Bhd (PIL), the main HSA palm oil subsidiary, about operations in Papua. In June 2018, after inquiries from NGOs and other companies, PIL/HSA stated: “Neither PIL nor HSA owns or operates any palm oil plantation in Papua. It terminated all such plans by mid-2017.” The company acknowledged that the HSA family had intended to invest in the Indonesian upstream palm oil sector. HSA noted on its websites that its directors were prominently visible in the plantation companies’ notary acts. In its recently submitted RSPO-complaints, EIA documented extensively why it believes that HSA/PIL is still involved in the Papuan plantation companies.